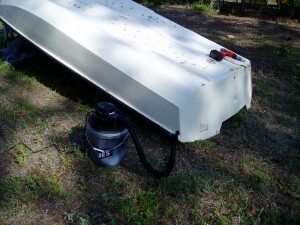 The foam in a Boston Whaler is a closed cell type foam and always has been. This means it does not readily absorb water. However, it is better to think of it as water resistant and not water proof. 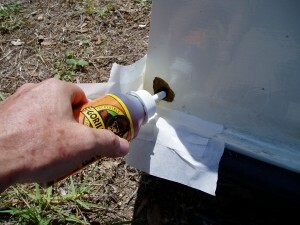 If there is a breach in the hull the foam will absorb water over time and the boat will gain weight. 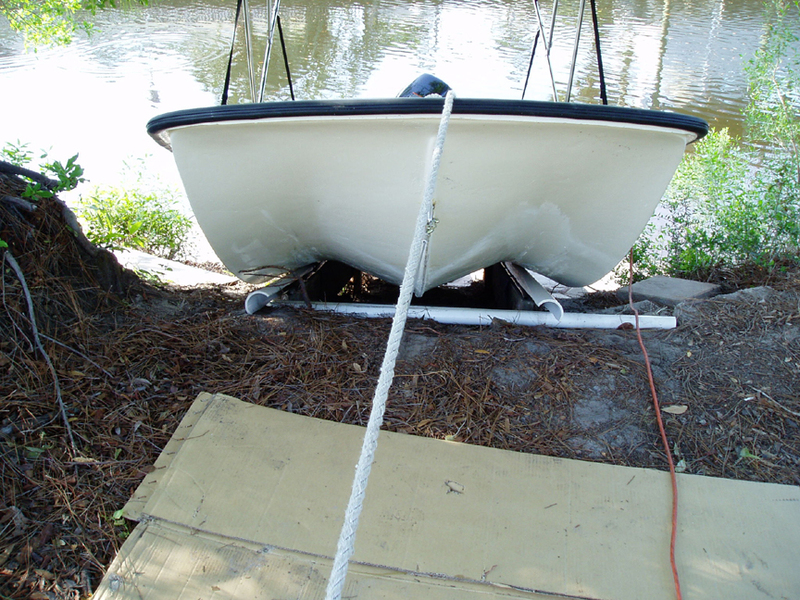 This is especially a problem if the boat stays in the water and there is a crack below the waterline. 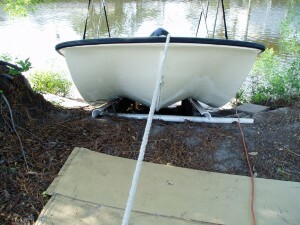 Or if the breach is inside the boat towards the back where water sits. In any event, if you find that your boat is way overweight then the only explanation is water in the foam. As you can see I attached a shop vac to the hole. Then I let it run for hours and hours. I did this on both sides. This pulls a vacuum and drys out a large area of the foam. After I removed all the water that I could I filled the void with Gorilla Glue and taped off the hole to hold the glue in. When it was dry I made a void and filled the area with epoxy inside and out. 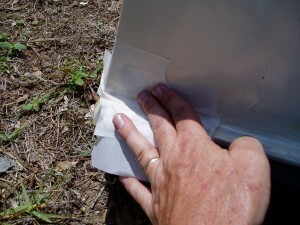 Then I sanded, laid a piece of fiberglass cloth over the area and applied resin to create a permanent repair. The second way I removed water was to put the boat at an angle like the picture above and drill some small holes at the lowest point in the rear of the boat. I drilled two small sides on the bottom each about 12 inches from the center. I let the boat drip for a few days and then dried the hole with a wet vac, made a void with a drill bit and then filled the holes with gorilla glue. Then I made a void in the gorilla glue and filled with epoxy. Then I sanded and smoothed on some West System epoxy. The holes were small so no fiberglass cloth was needed. When winter comes I may drill a couple of holes and let it drip all winter. Every little bit helps lighten the boat.